… not for those who are squeamish about snakes! I have a corn snake – that’s her/him (I don’t know which) above, called Sam. S/he is in the dream but is very real. So, in the dream, I meet Lewis Hamilton, who also owns a corn snake, which, for some unknown reason, I borrow. Maybe I was in a devil my care mood, I don’t know, but I also ordered one to be delivered with my weekly shop. A bigger, more aggressive one. A Python. It cost me £175. That seemed to be my biggest concern. So now I had three snakes. I was somewhere but couldn’t say where – there were lots of people around, somehow connected with F1 but not in the pits – which would have been apt, since the snakes were roaming around quite happily – but which is strange because a) Sam is kept in a tank (that’s her/his odd day out, in the paddling pool) for fear of her/him burrowing into a sofa and having to be cut free – as happened to the friends we re-homed her/him for – and b) no-one seemed to mind. I did try putting them all in the tank, but they were escape artists. Then another, smaller but pretty, snake appeared. Lewis assured me it wasn’t poisonous (because tiny and pretty = deadly). Lewis was wrong. There was much hissing and slithering as the big snakes all tried to get away from the tiddler. Freud had a theory about the interpretation of dreams. I wonder what he’d make of this one? I own a snake. I’d been reading about Formula One beginning on Sunday week. Adult fun: Who’s with me? Freelance journalist, Sam Jordison, has just released details of his latest book, Crap Towns, a tongue in cheek look at Britain’s urban sprawls. I don’t know how you nominated which town should be included but some Medway folk decided that our town* deserved a spot inside the covers. Now don’t get me wrong, I know Medway isn’t perfect but find me a town in Britain that is. With the exception of the idyllic one road villages scattered across the country (and look closer, you’re sure to find even they have their less desirable spots) every town will have the same issues as anywhere in Medway – the late night revellers and other social concerns. The difference in Medway is the amount of people doing positive things to give the local community a reason to be proud. And yes, while there’s a nice line in self deprecating humour “If Kent is the garden of England, Medway is its compost heap” and we’re happy to take the piss out of ourselves, we’ll jump to the defence of our patch. There’s a huge number of individuals and groups working to make Medway a better place and it’s frustrating when some residents clearly can’t be bothered to find out about them. No-one likes councils, it’s just a fact of life – doesn’t matter who’s in charge; But – free festivals abound for Medway’s residents, beginning with the Chinese New Year celebration in February and moving through the summer with the English Festival; Sweeps; Dickens; Fuse; Armed Forces Day; River Festival; Under Siege; Medieval Merriment; Will Adams, and then in December, we have the Dickensian Christmas. And they’re packed, not just with locals enjoying them but also bringing in people from outside the area to spend their cash in our local businesses. If live music is what you want, we have Homespun, ME1, TEA Concerts, Medway Eyes, Motherboy Noise, Suburban Kings, Manny’s Music and more, holding festivals and free gigs night after night in local pubs and clubs. Phil Dillon of Medway Eyes is a major fan and supporter – check out his Flickr stream. We’re rich in art and culture activities, and having a local consortium recently awarded Creative People and Places funding, this is only going to increase, with more people engaging the community in arts activities. Aligned to those already doing it – Rochester Literature Festival, LV21 and Creatabot to name but three – ongoing exhibits throughout the year at our galleries and other, more unusual spaces, and you’ll be tripping over arts activity from the moment you cross your doorstep. Assuming, of course, that you’re one of those positive residents who can actually be bothered to seek out them out. What’s on guides (both council and privately funded, such as WOW magazine) can be readily picked up or received through your letter box. Search on line for what’s going on in Medway and you’ll be inundated with results. Heritage: Absolutely no excuse to not know about our history with the RE Museum; Historic Dockyard, Fort Amherst, Medway Archive Centre, the Guildhall Museum and Medway Libraries activities. Plus, it’s all around you, living history in the walls of the castle, cathedral and other ancient buildings. Sport and hobbies: Loads of sports clubs encourage all ages to get involved, from badminton or sailing. Want something less strenuous? How about archaeology or Viking re – enactment? Residents’ Associations: The community folks who, with or without funding, work tirelessly to make their area better: South Shore RA; Chatham Big Local; All Saints Community; DNA; White Road Group. Parks and open spaces: Our landscapes are lovely, with Riverside, Ranscombe, The Vines, Victoria Gardens, Broomhill Park and so many more, most with ‘Friends of’ groups looking after them. Initiatives like Full Frontal Gardens have brought colour and nature to brick and concrete streets. All the above mentioned are a mere snapshot of what can be found happening in Medway. Whatever your hobby, interest or work, you’ll find others like you and the means by which to meet them and share your enthusiasm. Many community activities are free, so why waste time and energy being negative? Embrace what’s on offer to enrich your life. *Medway isn’t actually a town. It’s a river, upon which sit the five areas that make up the Medway Towns: Rainham, Gillingham, Chatham, Strood and the City of Rochester – we don’t recognize admin errors. The Royal Engineers Museum isn’t the only place worth visiting in Prince Arthur Road, Gillingham. Just opposite the award winning attraction you’ll find the Prince Arthur Road Indoor Bowls Club, where a regular Saturday morning Boccia Club is held and looks set to flourish in 2013. For disabled and able bodied people alike, Boccia is a low cost activity that everyone from age 7 upwards can take part in – so there’s no excuse not to work off that turkey and chocolate, together! Just before Christmas, the club held its very first tournament – a challenge extended by the Boccia Club to the regular indoor bowlers. With seven Boccia Club teams and five Prince Arthur Bowls teams, it was a well supported event. Unsurprisingly, it was an easy victory for the Boccia Club, who posted a huge winning margin. I went along with local film maker, Mdhamiri Nkemi, to find out more about it from organiser Malcolm Clark. Lynette Stock, who, along with Malcolm, began the Boccia club told us: “We started off with just a poster on the wall, asking if anyone was interested to put their name down. We had a man who came in and started us off with skittles, balls and hula hoops before being shown the proper game. Just one person came at first but gradually it took off, especially after we’d taken part in an exhibition day at Medway Park. It’s a perfect sport for severely disabled people, a good way for them to meet others and is very inclusive. I often stop wheelchair users in the supermarket and ask if they’ve heard of it – being involved is very rewarding. Severely disabled Charles is helped by Emily, who positions the specially designed hand pointer ramp for him, with Charles directing her with his eyes – ‘eye pointing’, as Emily puts it. Using his communications book, he told us “Boccia is good!” From the joy on his face with every good shot, it’s clear he enjoys it very much. Boccia became a Paralympic sport in 1984 and is one of only a few sports to have no equivalent in the Olympic Games. This year, we had nine players in the London Olympics and won two medals: Silver for David Smith in the BC1 Individual, and the BC1/BC2 team (David Smith, Nigel Murray, Dan Bentley and Zoe Robinson) winning Bronze. Each game uses six balls: six for one player in an individual game; three each in a pairs team or two each in a triple team. The balls used are either Red or Blue. Red team go first; colour is decided by coin toss. Red can place the jack to their advantage, beginning from Throwing Box one. The teams alternate, with Blue in Throwing Box Two and so on. Red throw the jack beyond the ‘v’ and the team skipper chooses which of his/her players have the best chance of getting closest. The other (Blue) team have their chance to throw, and will continue to do so until they are either nearest the jack or have run out of balls. Then the Red team take over again. Once all the balls have been thrown, the number of balls of the same colour nearest the jack wins that end and is recorded for the overall score. I.e. If a blue ball is nearest the jack but the next nearest balls are red, that would be one point to blue. Possession of the jack moves to the right, so throwing box two position will begin next. The winner is the one with the highest score after all the ends. In the event of a tie, a play-off round will follow until a winner is determined. Prince Arthur Road Indoor Bowls Club welcome new members, both as players or socially – give them a call and take the family along. England cricket star Chris Tremlett inspired a new (and old!) generation at Holcombe and Blue Bell Hill Cricket Club when he visited their ground last night. As the prize in a competition won by Lin Sharpe (one of HBBHCC’s U16 parents), Chris was on hand to oversee a fast bowling competition and then brave enough to face the barrage of questions from a packed clubhouse. DSCN9099 from Jaye Nolan on Vimeo. Winners of the fast bowling competition were: U11s Mark Robinson, 36mph; U13s Stephen Blakeman, 38; U15s Lucas Perry, 51; U17s Michael Reader, 58; Seniors James Underwood, 59. What will you do when your career is over? Who’s the toughest batsman you’ve faced? You took the final wicket in the last Ashes win over Australia – how exciting was that? DSCN9100 from Jaye Nolan on Vimeo. How do you cope with the long tours abroad? What do you think of Kevin Pietersen signing a new England Contract? How much has fitness training helped to change the sport? The hardest team to play against? And tricky bowlers if you’re batting? Who’s the best captain you’ve played under? 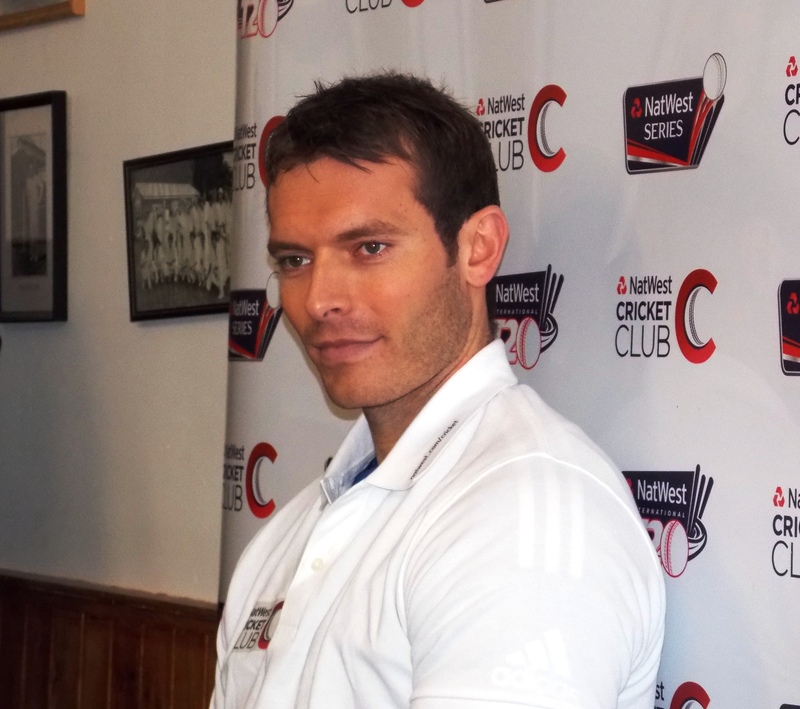 Chris Tremlett was brought to us at HBBC Cricket Club by Nat West, who run the annual Cricket Force days. These aim to inspire volunteers to pick up a paint brush or trowel for the local club and help rejuvenate its facilities for the coming season. This prize was just one of many offered by the NatWest Cricket Club this summer. Members have been able to access all sorts of rewards, from tickets to every NatWest ODI Series and NatWest T20 International match this summer to NatWest current account holders having the chance to enjoy exclusive experiences such as meeting and training with England players. Chris also signed and personalised a brand new Kookaburra cricket bat for one lucky raffle winner – who turned out to be James Phillips. Nat West then presented Chairman John Underwood with cricket bat signed by the current England team, which will be raffled next season. DSCN9101 from Jaye Nolan on Vimeo. The club would like to thank both Chris and Nat West for making this wonderfully enjoyable evening possible.